In January 2015, I adopted a flashy fawn boxer from Ohio that was already named Tebow. As Tebow became a part of our family on Island Estates, his charisma and expression-filled face struck me and I decided that I must write a children’s book through the eyes of this dog. My inspiration for “TEBOW TAILS~Caspar’s Conquest” emerged from my unbridled joy of children’s picture books, the unconditional love I have received from dogs, my inclination to imagine them with human traits, and the voyage of living in a beachside community. All of the characters are dogs that belonged to my family or friends. Many of my ideas in TEBOW TAILS came from living the Tommy Bahama lifestyle in Island Estates, and coasting Clearwater Beach and the Gulf of Mexico. For instance, Barkington Bluffs is named after Island Estates, and the Bait House/Salty Dog Marina is created from Clearwater Marina. Over the past few years, Sunday Funday has become my favorite day of the week and it often involves Jet Skiing and boating. 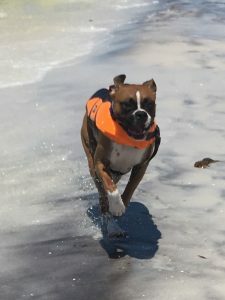 If you see a boxer with an orange life jacket on and a man, my husband Bob, cruising the inlets of the Island, give a shout out to Tebow. 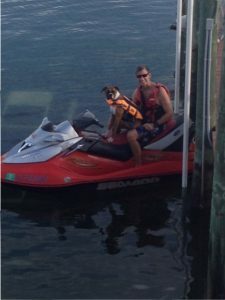 Jet Skiing is Tebow’s favorite past time. Hence, in the book, Tebow’s favorite day of the week is Sunday too. Before I attained Tebow, I had a red golden retriever named Hunter. Although he was friendly to humans, Hunter was a bully to other dogs. Tebow’s best friend, Caspar, the English cream golden retriever, was bullied by Hunter and as a result, is kind of a skittish shy guy but a loyal friend. This first book is an intended series, and “TEBOW TAILS,” shows readers how to respond or handle bully behavior, and the importance of treating friends the way one would like to be treated. Since I was a former elementary school teacher and college math professor, I strive for my children’s books to enlighten and entertain children and adults with positive life lessons, while engaging in many teachable moments. I am a Florida native and thrive in the spontaneous fun of living in a seaside neighborhood. When my grown children, Scott and Jessica, visit us at the beach, Tebow and Caspar know a new adventure is on the horizon.